Three words. The three words that I am about to type could end up saving you thousands of dollars in wasted money. Here it is, are you sitting down? Run your numbers. Run. your. Numbers. Why? Because sometimes a higher rate could be a lower cost of capital. Which of these is cheaper: 12% and 2 points or 16.99% and 0 points. 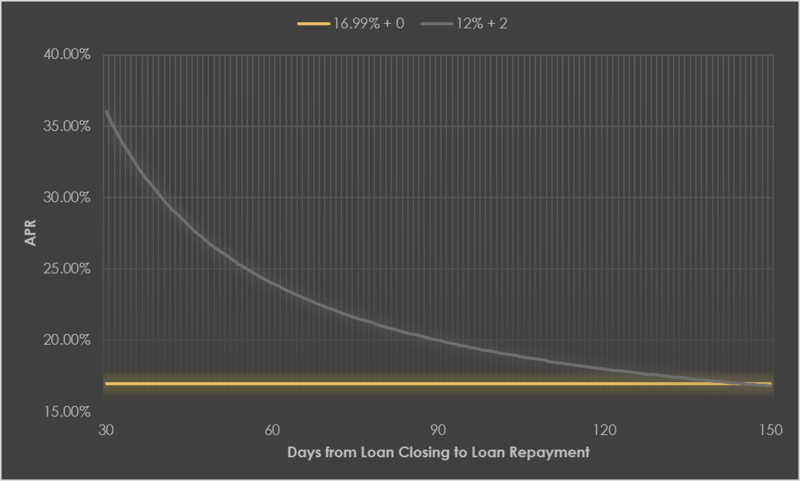 In the picture above, the curved grey line represents your cost of borrowing at a given time at 12% and 2 points. The yellow line represents 0 points and 16.99%. As you can see, the lines intersect, and a the difference between the lines is the amount you would save or lose. If you were able to rehab quickly enough, 16.99% would be cheaper than 12%! What happens when you add two more points on to the 12? 16.99% is cheaper than 12% and 4 points until day 288; that’s nearly 10 months! Now let me ask you this: which of these is the better deal? Answer: It depends. To compare, you need to know how much money will be out and for how long. Let’s look at an example. The loan for the purchase is $100,000. The construction loan is $60,000, provided in 3 $20,000 draws on days 30, 45, and 60 of the project. Also, the property sells and the loan is repaid on day 120 of the project. Here’s what the two loans would look like; 12% on funded and unfunded amounts compared to 16.99% on only funded amounts. The gray area shows how you accrue more interest, even at the lower rate! 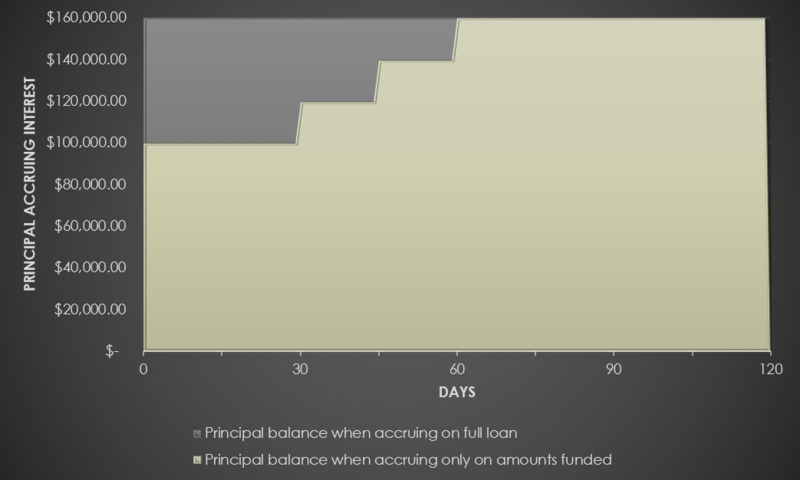 12% accruing on the full loan amount = $6,400 in total interest. 16.99% accruing on only amounts funded = $5,500 in total interest, a savings of $1,100. 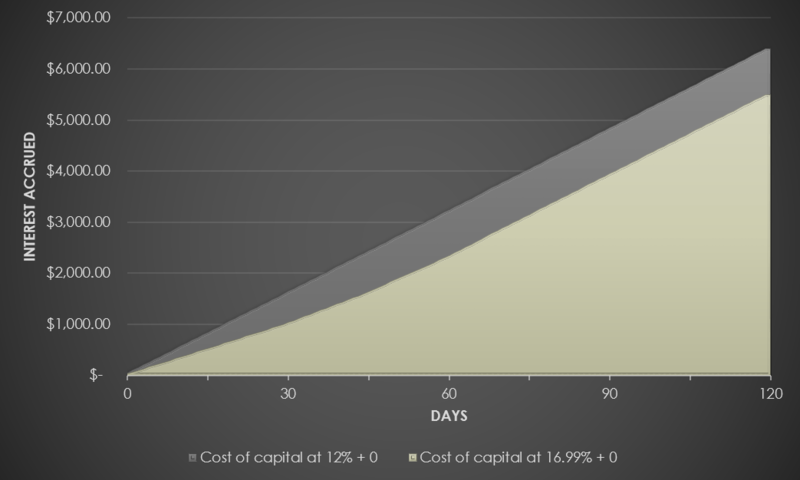 Counter-intuitively, your costs of capital are 14% lower at the higher rate. It gets even worse with points! So, what’s the point? 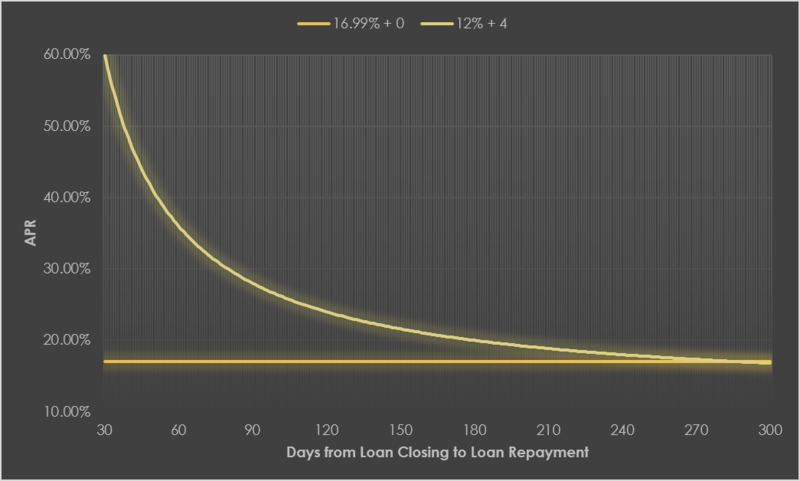 Well, paying interest on only amounts funded can result in big savings, even at a lower rate. The larger your construction budget, the better paying on only amounts funded will be. 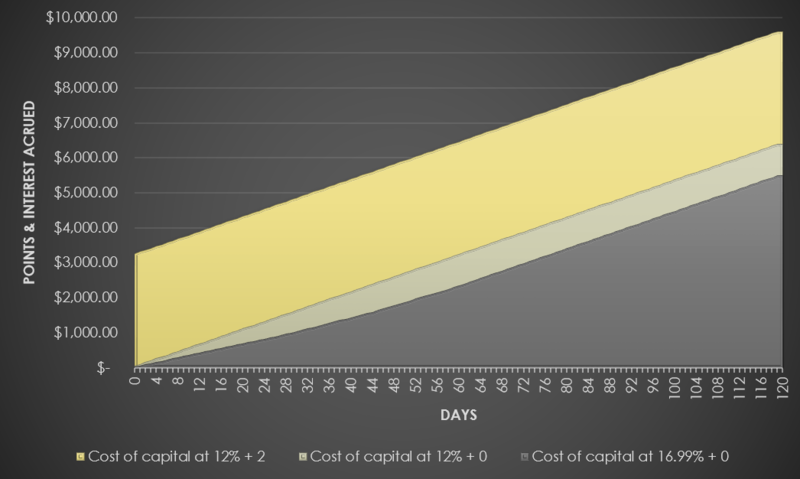 Paying on only amounts funded will save you more the longer it takes to reach full funding. And, of course, run your numbers! !